On this Day of Return for the Palestinian people, the settler state of Israel repeated its genocidal policy of extermination, leaving at least 16 dead and over 1,200 injured, according to the Palestinian Health Ministry. Unión del Barrio is a Mexican and Latin American organization based in California, and we have struggled for over 35 years for the self-determination and liberation of the Mexican people within the political borders of the United States – what we consider occupied Mexico. We understand what it means to be repressed on our own land, and we condemn the violence and terror of the Israeli state. We have seen the consequences of Israeli occupation suffered by the people of Palestine, and in particular the people of Gaza who have had to endure an ongoing illegal blockade. 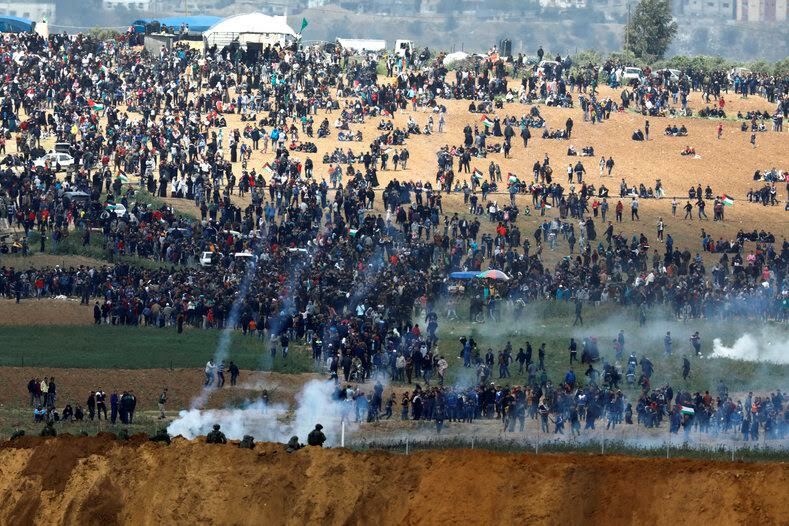 The violent attacks against Palestinians who protest illegal borders that separate them from their land and resources can only be qualified as war crimes. We are also besieged by apartheid walls that mark the political border between the US and Mexico. The Mexican liberation struggle thereby stands with the people of Palestine and with their righteous struggle for self-determination, and we stand in unity with the Palestinian right to return to the lands that are illegally occupied by the settler State of Israel. While we may be two different people, our struggle is one – we denounce all forms of colonial terror and support the right of self-determination of all peoples! The courageous resistance of the Palestinian people is not lost to the billions of displaced people around the world, and we are confident that through unwavering solidarity and the continued resistance, justice will prevail. From the river to the sea Palestine will be free! Free Ahed Tamimi and all Palestinian Prisoners! Self-determination for the People of Palestine! ¡Viva La Lucha Palestina! This entry was posted in 2018, Anti-War, Organizational Updates, Self-Determination, Solidarity, Statement. Bookmark the permalink.